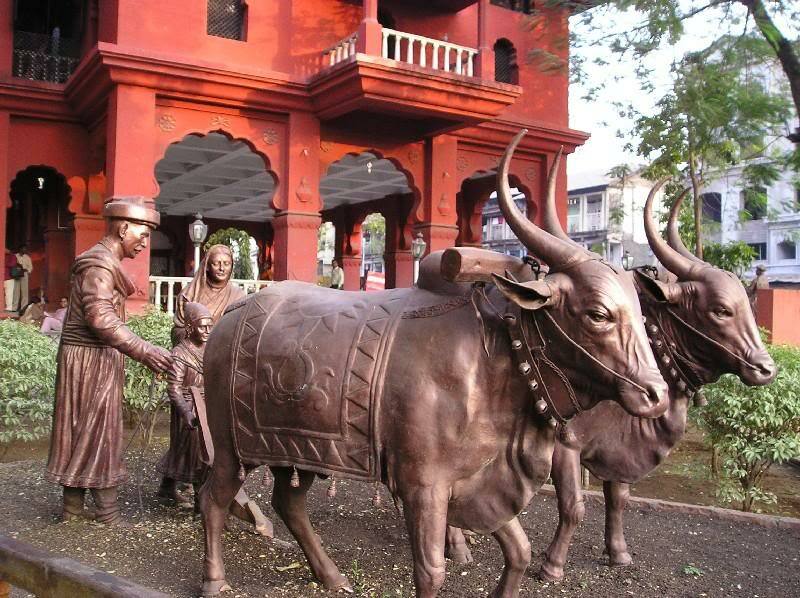 In the History of Pune, it so happened that the Golden plough was used to plough the land. Really it was thrilling and sensational. In 1630 the Adilshahi Sardar Rayarao looted pune. He ploughed the Pune with the help of Donkey's. Pune was ruined by him. Then in 1630, Shahaji Raje had Pune paragana(a district). Little Shivaji and mother Jijabai came to Pune. She cam to Lord Ganpati Temple to offer prayer and after that she observed destroyed Pune. The only thing left by the Adilshshi Sardar "Raya Rao" was a digging rod, a broken cowerie and torned footware. It means that nobody had to inhabit here in Pune, even not a little lamp. Being uneasy and anoyed Jijabai asked Dadaji Kond-deo to build Lal-Mahal for little Shivaji Raje to create belief in the people of Pune She called them back and ploughed the land with a Golden blade connected to the plough. A thrilling moment in the History of Pune ! the begning of Pune's prosperity means this Golden Moment. Shivaji Raje who used the golden blade for ploughing became the Maratha King and was seated on the Golden throne. In Shivaji Rajes Life many important events took place in Pune. Each one can observe the fact by visiting "LAL MAHAL". This entry was posted on Tuesday, July 6, 2010 at 12:18 AM . You can follow any responses to this entry through the comments feed . glad to know this story. The Journey of the Great Warrior !